Martin Powell-Davies - teacher trade unionist and socialist: Lewisham NUT Briefing pledges to go out and win the ballot! 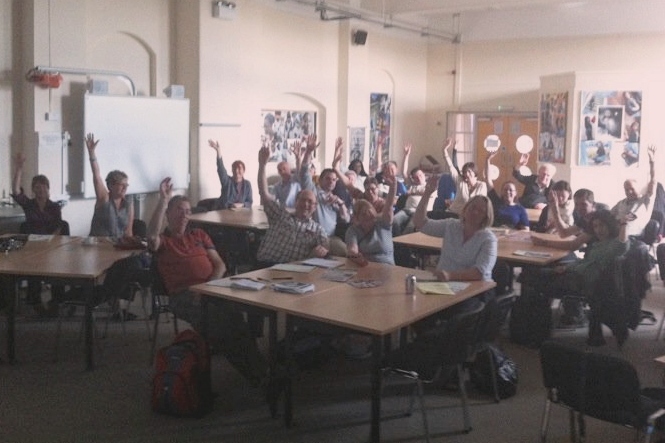 Lewisham NUT Briefing pledges to go out and win the ballot! An excellent joint ATL/NUT briefing in Lewisham tonight laid a firm foundation for getting out an excellent ballot result in favour of strike action to defend pensions. 48 staff attended from a wide range of schools. There were a few issues to clarify - like what the pensions robbery meant for young teachers, how NASUWT members could join the strike action (by joining the NUT!) and about how many schools would close across the borough on June 30 (we thought most!). Teachers agreed to take on the job of chasing up the vote in their schools - from both NUT and ATL members - and contacting other schools besides. 40 different school 'registers' were taken away by staff who promised to chase up the vote in those schools - which means that the NUT officers can now concentrate on getting in touch with the other 50 or so remaining workplaces.